Perhaps the longest running race in the history of mountain bike racing, the Revenge of the Rattlesnake starting and ending in Davis, West Virginia is the latest in my series of must do races. ROTR, as it’s called, first began in 1983 and became part of the Canaan Mountain Series back in 1984. I did this race when it was called the Canaan 40K a couple of times in the mid-ninties. By the late-ninties, as the mileage and duration were creeping into ultra endurance territory, the Canaan 50K’s name was changed to Revenge of the Rattlesnake. The story is that Eric Cvechko, a racer in the 1998 edition, was struck in the foot by an angry rattlesnake as he rode past. After dragging the snake a short ways as it was clamped onto his shoe, the snake, aparently run over by the rear tire, fell dead to the ground. Eric dropped out of the race, carrying the dead reptile in his fanny pack back to the start. The name stuck and the mystique of this race has grown ever since. ROTR recent editions, promoted by Blackwater Bikes, are now up to 40 miles or more and normally have a different course every year. This year’s route, identical to the 2009 edition apart from the starting rollout, encompassed trails in Blackwater Falls State Park, National Forest- Canaan Mountain, Canaan Valley Institute property and Vandelia Heritage Foundation property. 40 miles of tough course consisting mainly of technical, gnarly single track. I think it’s safe to compare the technical component of Canaan Valley West Virginia riding with anything on the east coast in terms of difficulty. With an elevation of 3,200 feet, the small town of Davis is the highest incorporated town in the state of West Virginia. This provides the 600 resident Tucker Country retreat with a cool climate year-round. The trails for ROTR climb up to 4000 feet, leading to some Occasionally Often extreme weather. Last year’s ROTR was conducted during a heavy rain with temps in the 40’s! This past weekend I joined good friends Pete Johnson Mike Gallagher, Christophe Cataisson and Jeff Haggquist for the 2010 edition. We were given a perfect indian summer day with sunny skies and temps in the mid 70’s. Bang! We’re off on a gravel road heading west along the banks of the Blackwater towards Blackwater Falls State Park. About a mile in, there’s still a long two-column train of riders jockeying for position. I’m on my geared Superfly and the fireroad is flat and fast. I pass single speed riders Michael Boyes and Gunnar Shogren who, like me, are also racing in the Masters class. As we progress, the fire road get’s more rutted out on the left and right. I move to the center where the ground is more consistent. The rider on my right and slightly ahead, has the same idea and changes lanes right into my front wheel. Forced down into a gully, my front wheel washes out and I go down. Crap! One rider rides into my legs as I’m moving out the the way. Michael Boyes rides over the rear wheel of my bike as Gunnar yells what are ya doing on the ground? as he rides by. After ten or twelve riders go by, I quickly check my bike over, remount and I’m on my way. My knee and elbow are bleeding from gravel road rash abrasions, but other than that, I’m ok. We get to Yellow Birch trail which is the first taste of the rocky single track to come. Between being rattled by the crash, my heart rate still too high and having a bit too much air in my tires, I’m not riding it well. After awhile we’re riding counter clockwise on the Canaan Loop road which starts as pavement but quickly turns to gravel. Even though September has had record low rainfall in Canaan Valley, there are lots of big deep puddles. I begin to catch another geared rider my friend Mike Buchness. My heart rate is still too high. Mike and I have been on the same race schedule for a month now and I know he’s riding well. He’s also is quite disciplined about controlling his pace. I need to settle down. I get on his wheel and finally do. In what appeared to be a perfectly timed move, Mike Boyes and another rider fly by Mike and I just beating us to the right turn into single track which marks the beginning of Mountainside trail. They are riding well and get a decent gap on us. What starts out as fun twisty single track, ends up being very rocky primitive double track. There is no smooth line. I’m getting shaken to pieces on my hardtail. Riding a full suspension Trek Top-Fuel 9.8, Mike starts to slip away. I pass eventual second place single speed finisher Mark the Elk Elsasser fixing a flat. I ask if he’s got everything he needs. He says yes. Eventually, Mountainside smooths out into a fast descent and I catch Mike again. As we start the only long climb of the day, I start to pull away. Mountainside rejoins the Caanan Loop road on the south side. We hang a hard left and start riding the loop road clockwise towards where we just came from. As I’m eating, Mike catches back up. He’s climbing well. I blow though Aid #1 at 1:31 since I still have a full bottle and make the right onto Plantation Trail. The next 8 miles will be rocky technical single track all the way to the next aid station. I bobble on the first climb and let Mike by. He didn’t stop at Aid #1 either. He’s going to be tough today. I ride the entire length of Plantation trail dangling off the back of Mike Buchness. The only other rider I saw was eventual Single Speed winner Rob Lochner who passed us both about a third of the way through. We finally pop out on Route 32 at the end of Plantation. Mike rides by Aid #2. He’s got a huge Camelbak and a 100 foot lead on me. I don’t think he’s going to stop at any Aid stations. It’s a quick 30-40 minutes down to the Blackwater river and the next aid station. I’ve got a third of a bottle. I don’t want to lose the wheel of Buchness, so I blow by Aid #2 as well. A short way up 32 we cross make a left on a gravel road. We’re still climbing. I catch Mike again by the time we get to the very highest part of the course near the weather station. I get on his wheel for the descent. He’s riding cautiously, maybe a bit slower than I would be going by myself, but I’ve already crashed once today, so I’m satisfied to remain on his wheel. After a fair bit of gravel road descending, we take a left into single track and begin climbing again. For the first time in the race, I feel hot. The sun is out and the single track is really just a lawnmower cut trail through a grassy field intermixed with tricky sections of rock gardens where Mike is dropping me. We finally top out and do what’s probably the most fun single track of the day. The final descent through the woods down to the Blackwater. We cross the Blackwater river by wading waist deep holding bikes overhead. After climbing up the far side embankment, we ride a fast mile or so down Camp 70 to Aid #3. By now I’m out of fluids so I have to stop. I grab two bottles and start trying to regain contact with Mike who rode right on by. I’m starting to feel some fatigue set in. I’ve been falling behind in hydration and I’m starting to pay. I can see Mike is pulling away as we begin the climb of Hoo Doo Rocks. I loose sight of him about half way up. I’m suddenly not riding the rocks very well and bobble a couple of easy sections. This is mentally the toughest part of the race. I finally start the short descent off of Hoo Doo and climb up onto Moon Rocks. Moon Rocks is this amazing large rock formation which is the Canaan equivalent of slick rock… only not that smooth. The locals know the lines. I sort of do. I was hoping to hold the wheel of Mike just a bit longer so he could show me the line down. No such luck. I make a bad choice and have to get off. After I remount and finally seem to be remembering how the line goes, Elk catches back up and I lead him down the rest of the descent off of Moon Rocks. At the bottom, he goes by and quickly disappears. He’s riding strong. I’m feeling weak. The last five miles go by painfully slowly. It’s pretty much all single track heading mostly south on back towards Davis. Given my elevated fatigue level, there’s just enough rocks to keep the pace slower than I’d hoped. I eventually cross the line at 4:25, good enough for 3rd place in Masters behind Gunnar and Michael Boyes. 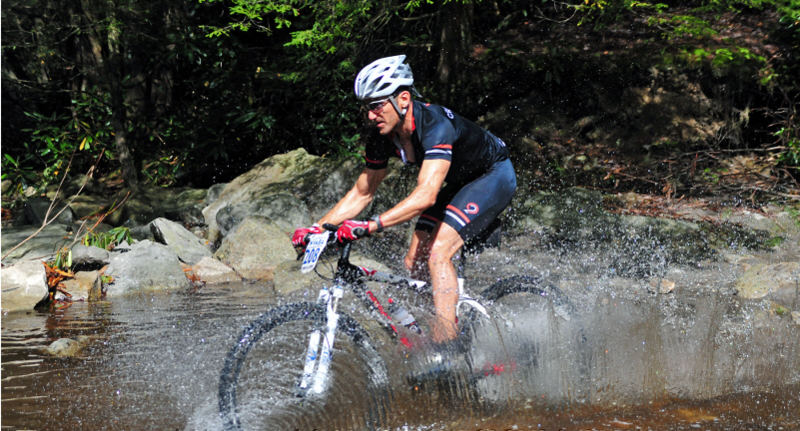 Fellow 29er Crew teammate TJ Platt was the overall winner and the only rider to finish under 4 hours. TJ was rockin’ what must be a 27 pound Gary Fisher Rumblefish proving that suspension travel and what’s on top can overcome a little extra weight. TJ is a legend. Joey Riddle was 2nd in the open and 3rd on the day. Brad Schmalzer rounded out the open top-3 and was 5th overall. Mike Buchness who finished five minutes in front of me managed to grab 4th in the open. Great ride my friend! The big man Rob Lochner won the single speed and was 4th overall. The Elk came back strong after his flat as the 2nd single speeder. Mark Glass finished 3rd single speed. I passed him in the last mile and he looked even more tired than I felt. Riding single speed, my shy friend Gunnar won the Masters category and was 2nd overall! Well done young man… If we can take out TJ somehow, with your ponytails from your facebook profile photo, you might be able to enter and win all 4 categories simultaneously next year! Mike Boyes took the 2nd slot Masters. I never saw him again after Mountainside. I managed to edge out Don Campinelli for the last Masters podium spot and 10th overall. Gunnar’s better half Betsy Schauer Shogren won the women on single speed and in 13th place overall! Damn, you girled like 50 guys! Susan Musante finished 2nd. Susan says this is her place in life… she finishes 2nd an awful lot! Mandi Riddle was the 3rd rounding out the woman’s podium. Congrats to friends Pete Johnson Mike Gallagher, Christophe Cataisson and Jeff Haggquist for completing the 2010 ROTR. They got revenge on Revenge! Last year they all abandon the race on Mountainside trail in order to help a racer who had fallen and broken his hip. With the rain and low temps he was slipping into hypothermia. They probably saved his life. Huge thanks to Roger Lilly of Blackwater Bikes for loaning me his Avid bleed kit to fix my bike and for once again letting us use his store as our race-day home base. Blackwater Big Boy Todd Romero did a great job promoting and crafting some really cool trophies. Thanks bro. I love Davis and hate to leave there. It’s a great little town with great people and a great vibe. It has a growing number of cool small businesses like Hellbenders Burritos, Mountain State Brewing Company and (in next-door town Thomas) the Purple Fiddle. Davis has an outdoor kind of feel with fantastic mountain bike and backcountry ski opportunities. On our way out of town, we stopped as we always do at Hypnocoffee, my favorite coffee shop in the world. 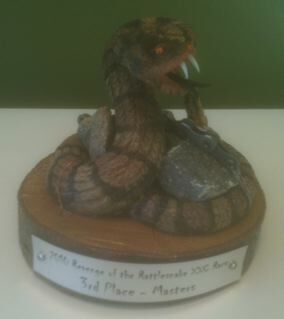 Before leaving, I left my coveted Todd Romero rattlesnake trophy at Hypno. I’ll miss not having it, but it just seemed wrong to remove the snake from Davis. This entry was posted on September 23, 2010 at 2:56 pm and is filed under Must do Races. You can follow any responses to this entry through the RSS 2.0 feed. You can leave a response, or trackback from your own site.